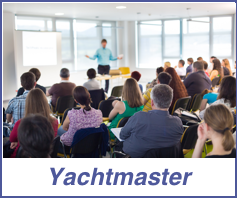 Advanced training for more experienced skippers building on the Day Skipper Shorebased course.This course equips you to navigate safely on coastal and offshore passages. It allows some time for revision of the basics and then moves on to advanced navigation techniques. The course is classroom based and taught over 40 hours with concludes with three exam papers. Course topics include: Position fixing, course shaping and plotting, tidal knowledge, use of almanacs and admiralty publications, electronic position finding equipment, taking and interpreting forecasts, plotting weather systems, weather predictions using a barometer and by observation, collision regulations, customs and excise regulations for cruising abroad.